What's up with Ward's Hair? 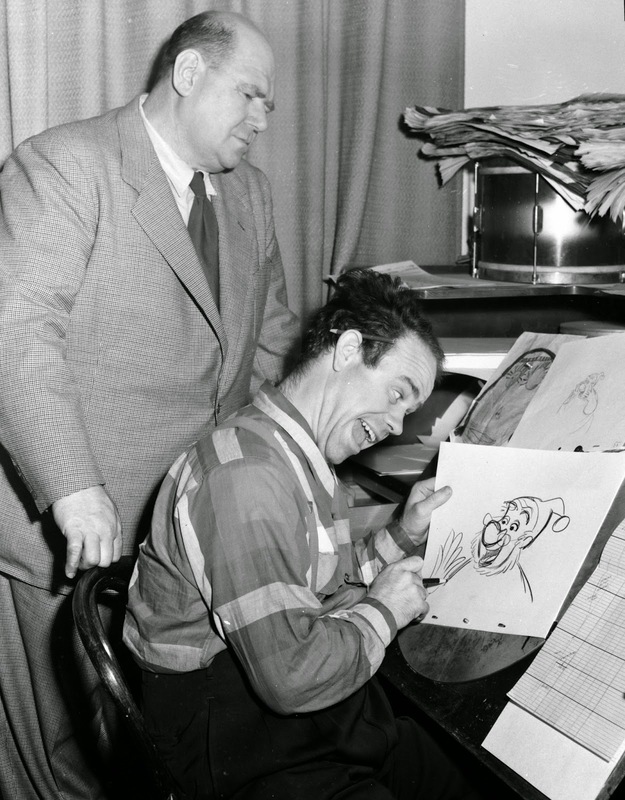 Furthermore...why is Ward drawing Smee from the Disney film Peter Pan in this publicity photo? Story sketch artist/Mousketeer Roy Williams doesn't seem to be too impressed looking over Ward's shoulder. Kimball is actually referencing a rough animation drawing by Ollie Johnston, placed above his sketch. Perhaps Ollie was out that day, when a photographer went around the studio taking pictures of animators, who worked on Peter Pan. Most of you know that Ward didn't do any animation with Smee, instead he brought the Indian Chief to life (a character that taught me how to have fun with animating dialogue scenes). I feel lucky to own this complete rough scene of Ollie's. Smee, a little buzzed from drinking wine, is encouraging Captain Hook to leave Neverland. The drawings will be published in my upcoming Focal Press book on the work of Disney's Nine Old Men.